Would you be amazed to learn that now, it’s possible to straighten your teeth in just months instead of years? The latest trend in orthodontics today is Invisalign, and it can give patients beautifully straight teeth in an average of 9-15 months instead of the 2-4 years traditional braces can often require. 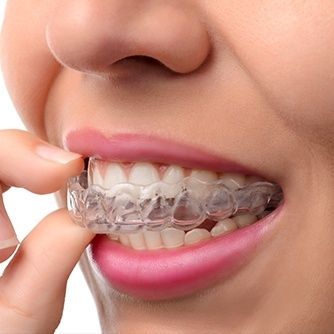 There are no metal wires or brackets required with Invisalign either – instead, your teeth are comfortably straightened with a set of customized, practically invisible, and removable plastic aligners. In the past, the only option for orthodontic treatment was those bulky braces made of metal. But as more and more adults began to opt to have their teeth straightened, the need for a more mature choice became clear. Now, with Invisalign, Farmington adults and teenagers can choose to realign their smiles with clear braces. Like traditional braces, Invisalign can correct many cosmetic imperfections. For some of our patients, the problem may be crooked or crowded teeth. Others may be bothered by an overbite or teeth that have wide gaps between them. Whatever orthodontic concerns you have regarding your smile, Invisalign may be the right solution for you. Before a patient can begin any kind of orthodontic treatment, Dr. Metzger always schedules a dental checkup to ensure your oral health. Any problems, such as cavities or periodontal disease, should be taken care of before you start wearing your Invisalign aligners. Then, Dr. Metzger works hand-in-hand with an Invisalign lab to develop a treatment plan that will address your unique orthodontic needs. Using X-rays, photographs, and impressions, the lab creates 3D images of your teeth. With this, Dr. Metzger can visualize exactly how your teeth need to move. And Plus, with the 3D image and treatment plan, she can even show you her visualization so you’ll be able to see exactly what your smile will look like once you’ve completed treatment. The aligners are organized in a sequential series of sets that you’ll wear for about two weeks each. At the end of those two weeks, simply throw away the set you’ve been wearing and move on to the next. Although Dr. Metzger will want you to wear your aligners for most of the hours in a day, you will be able to remove them at mealtime and when you need to brush and floss your teeth. The length of treatment depends on your specific case. 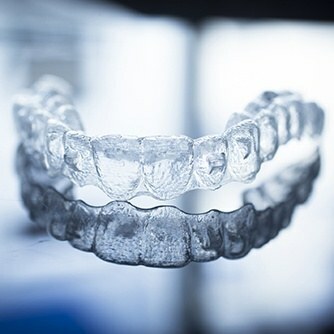 For most of our Invisalign patients, the time spent wearing their aligners is usually no longer than what would be required for traditional braces, and in fact is often much shorter. As you progress from month to month, you’ll see your teeth begin to realign beautifully, and your smile will become the straight one you’ve always wanted. 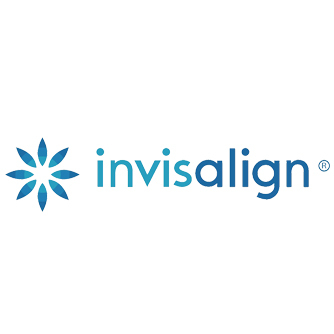 Not sure if Invisalign is the right choice for you? Contact our dental office to schedule a FREE consultation. Dr. Metzger and her team look forward to welcoming you!